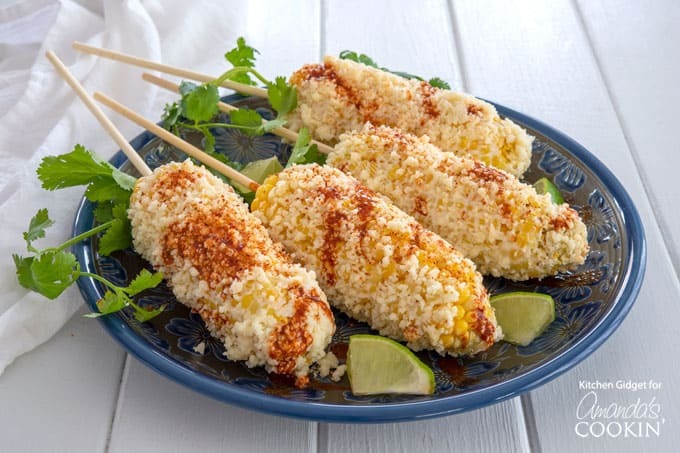 Mexican Corn on the cob with cheese, mayo and Latin spices is the perfect summer food! Enjoy this Mexican street food anytime with this easy recipe! 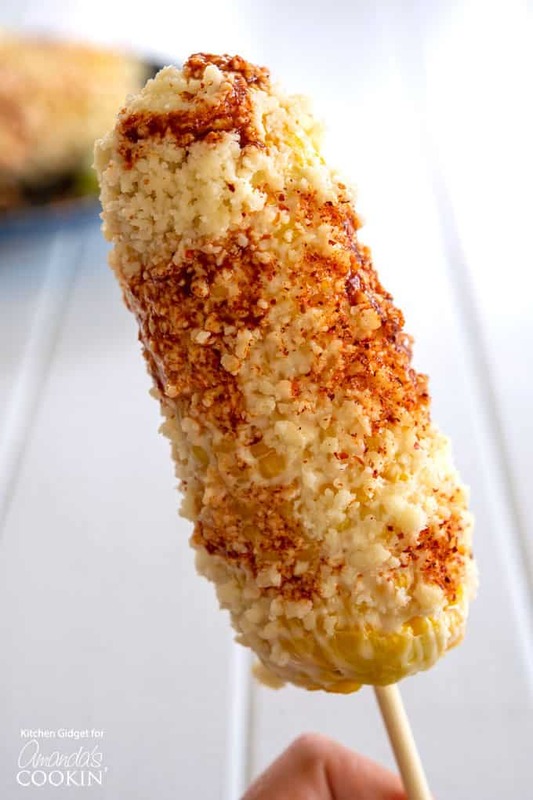 We call this Mexican corn elotes, but it should just be known as the best corn ever! An incredible combination of deliciously sweet corn, salty cheese, creamy mayonnaise, smoky chile, spicy hot sauce and a burst of lime. It will leave you craving for more! While we love crockpot corn on the cob, this authentic, flavorful Mexican street food really kicks it up a notch. It can easily be made at home and is the perfect accompaniment when grilling out. It’s amazing on Mexican night with your favorite tacos. My favorite kind right now are Tacos Dorados which are filled with mashed potatoes and fried until ultra crispy. The preparation of Mexican corn is simple. The key is to have all your ingredients gathered and prepped for easy assembly. For this recipe, you will need corn on the cob. If using corn kernels you can make my recipe for Mexican Corn in a Cup instead. The corn cobs can be cooked in any method you prefer – I recommend boiling or grilling. 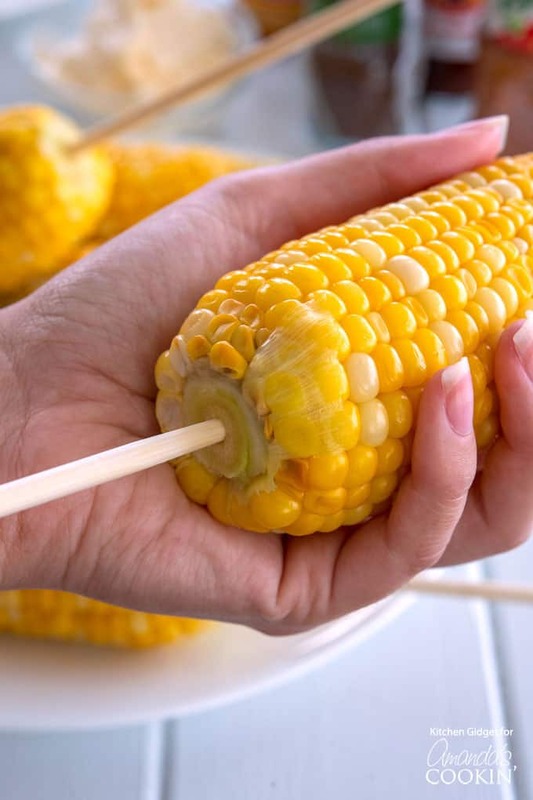 If fresh sweet summer corn on the cob isn’t available, frozen corn on the cob can be used. After the corn is cooked, you’ll want to let it cool a little for two reasons. First, you’ll be inserting some wooden sticks for handles and you don’t want to burn your fingers off. Second, you’ll need to slather it in mayonnaise and if it’s too hot, the mayo will slide right off. The remaining ingredients need to stick to the mayo. Pro tip: use a pastry brush to spread it evenly. 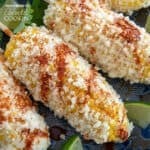 After the mayo has been applied, sprinkle or roll the corn in grated cotija cheese. Cotija is a sharp, salty cheese. If you absolutely cannot find cotija then you can use parmesan cheese. You can also use crumbled queso fresco, but it will have a totally different flavor. The last three ingredients are important but depend on your own taste. Lime juice is going to add zest, brighten and enhance all the flavors. Chili powder adds a great smoky flavor. My personal favorite is Tajin, which is a chile-salt blend. Ground ancho chile is also a great choice. Hot sauce is the final ingredient to add another dimension of flavor and some heat. There are so many options when it comes to hot sauce, but my favorites for Mexican street corn are Valentina or Tapatio. Add as much or little as you like depending on your spicy tolerance and enjoy! Another delicious Mexican recipe we love is this Sopa De Fideos. This noodle soup has tons of flavor and is a family favorite! We absolutely love Mexican food and all of its amazing flavors! Mexican Corn is an amazing side dish for tacos or Carne Asada. 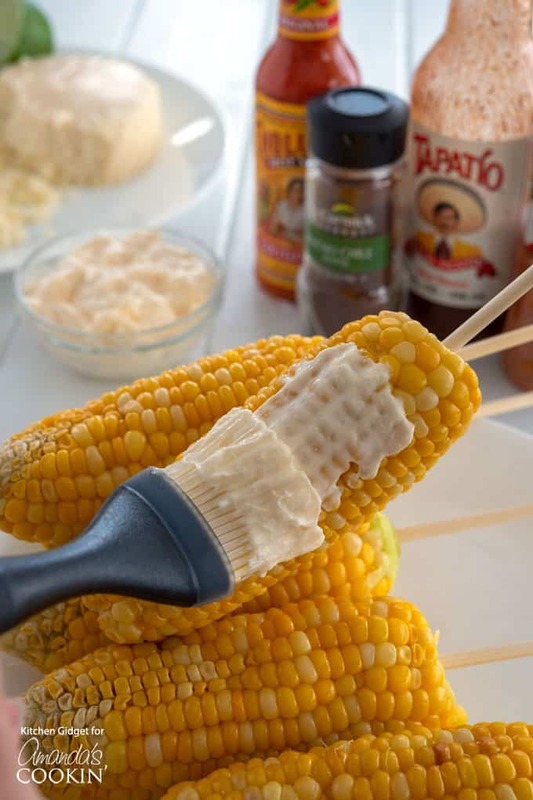 Mexican Corn on the cob with cheese, mayo and Latin spices. Enjoy this Mexican street food anytime with this easy recipe! Bring a large pot of water to a boil. Shuck the corn, remove the silk and stalk. Add the corn to water, cover and cook for 5 minutes, then remove. When corn is cool enough to touch but still warm, insert wooden stick into core as a handle. 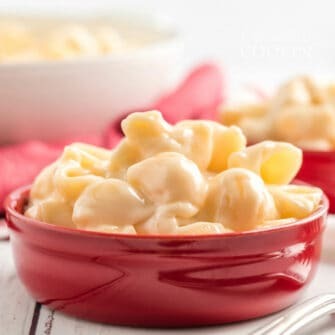 Brush corn with 1 tablespoon of mayonnaise, sprinkle with 2 tablespoons cheese and squeeze of lime wedge. Add hot sauce and chili powder to taste. Repeat with remaining ears of corn and serve.